Miranda in Milan is a imaginative character study that reframes the history and life of one of Shakespeare’s most famous heroines, carrying her story forward from the original play. “Oh, wonder! How many goodly creatures are there here! How beauteous mankind is! O brave new world,. That has such people in 't!”. Miranda’s declaration is one of the most famous in Shakespeare. Aldous Huxley borrowed it for a novel title (and filled his novel with plenty of other Shakespeare quotes besides). But it is a innocent declaration, one that Miranda was always destined to be disabused of the moment that she left the island and encountered lands outside of her father’s island. But what would happen to Miranda once they left the island? Would Prospero truly give up magic? 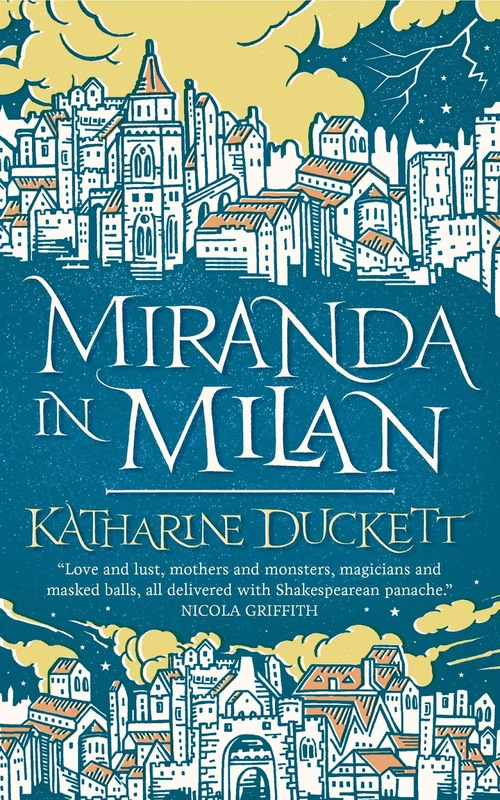 These questions are answered, and Miranda gets her own story, and her own centrality as a heroine, in Katherine Duckett’s Miranda in Milan. The author dumps Miranda and the reader into the deep end immediately, casting her into a Milanese court that her father now rules. Even though she is the daughter of the ruler of Milan, Miranda’s life and position are uncomfortable, for reasons that are only slowly made clear. The cutthroat Milanese court life is a world far removed from the island, and Miranda’s place within the palace is a precarious, fraught one. The book is imaginative, putting Miranda front and center of her story and giving her agency, goals, and desires of her own--even if she isn’t quite sure what those should be. The book is evocative as we get a deep dive into the thoughts, and more importantly and more poignantly, the feelings, often conflicted, and always passionate and soul-tugging, that she feels. This is a character based story, very much about Miranda trying to figure out who she is and where she came from, and what her place in the world is. There is a plot thread, and revelations about what her father, as Duke of Milan is up to. But that’s not the main thrust of the story. The story is Miranda and her relationship with Dorothea, and the legacy of finding out who her mother really was, and who she is that this story revolves around. It’s a story of self-discovery and coming into herself, in a pressure cooker environment. 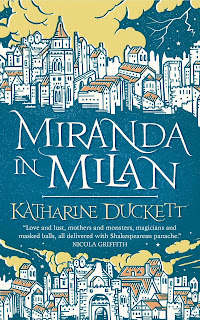 And, oh, yes, there is a tentative, fledgling, queer romance at the heart of Miranda in Milan, as Miranda starts to learn what she really wants for herself, what she really feels, and tries to articulate those feelings and desires. I’d have liked a little more from the other side of the romance, Dorothea, though. While some secondary characters are well explored, like Agata, and Bice, Miranda’s mother, Dorothea feels more mysterious and nebulous, perhaps deliberately so. I also am not sure that the gear shift of Prospero’s nature in Milan is entirely smoothly transitioned from what we see in The Tempest. My major disappointment in the story, though, is in its epilogue. When I think of an epilogue, I think of it is a postscript to what has happened, a final close to what has occurred, an exit to the narrative that eases us out of the book. The issue I have with Miranda in Milan is that the epilogue, here, instead hashes out a major decision and sudden change of plans for Miranda, in a not entirely satisfactory way. It’s a swerve and it’s not as well prepared earlier in the book that I would have liked. It feels too abrupt to be the note that the book ends on, and this structure subsequently left me disquieted. There is also a quite anachronistic bit of history and geography in the epilogue which rankled as well. All this feels like a false note to end a book I had otherwise been enjoying.